The beautiful undulating sand dunes of the Sossusvlei are one of the biggest attractions in Namibia and they further compound the image of Namibia as a largely desert country. Although the name is used to describe the area, it in fact only refers to the dry salt pan stretched out amongst the red dunes. When the Tsaugab river receives enough rain it rushes down to the west and fills up the depression to form a beautiful oasis. The nearby Deadvlei valley is also of great photographic significance with the skeletons of Acacia trees dotting a dry white pan. 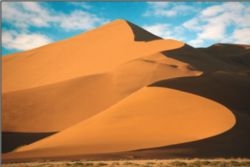 The Sossusvlei dunes are regarded as some of the highest in the world and make for a very challenging scaling adventure. Your reward for climbing them will be immense as the view is quite spectacular. Other notable natural formations in the area include the Sesriem Canyon and the Nara Vlei. The gates to Sossusvlei only open at sunrise and close again with the sun sinking behind the horizon. There is a 2x4 parking area just before the vlei, beyond this area a 4x4 vehicle is a necessity. Guests can either walk from here to the pan or make use of the 4x4 shuttle service to and from the sites. Best times to visit this stunning area are early mornings and late afternoons when the sun does not bake down relentlessly on the desert sands.